Do you remember ’37 flood? Know what was Madeira’s hub during 19th century? Remember when boys published their newspaper? Remember when sledders, skaters flocked to Madeira? How do you get a name like Jethve? Mystery Man or Just Snow Job? The Madeira Historical Society is organized for the purpose of discovery, preservation and dissemination of knowledge about the history of Madeira and the surrounding area; specifically, the discovery and collection of materials which help to establish and illustrate the history of the area; the preservation of materials for examination and study; and the dissemination of historical information. Saturday March 23rd – Miller House Grounds Cleanup – 9 AM – 1 PM. Bring your gloves, rakes & blowers. Call 513-561-9069 or email madeirahistoricalsociety@gmail to volunteer. First Open House in 2019 is Saturday 4/6/19 from 1 – 4 PM. Bring the whole family to see our new exhibits! These articles were featured weekly in Suburban Life-Press. There are over 600 stories about Madeira published over a span of fifteen years and we have the honor to host them on our website. 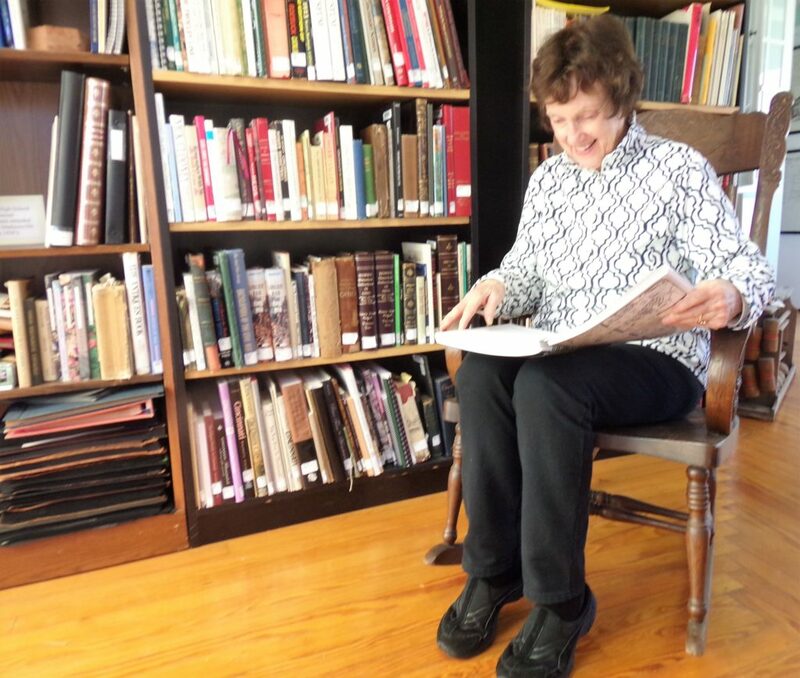 Regina is a longtime resident of the Madeira community, raised her family here, taught school in Madeira, and is legendary for providing over fifteen years of historical reading enjoyment. Her articles have been featured many times in many venues throughout the years. 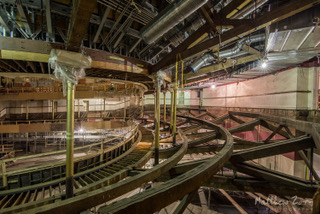 We are excited and proud to be able to share this history of our community with you. 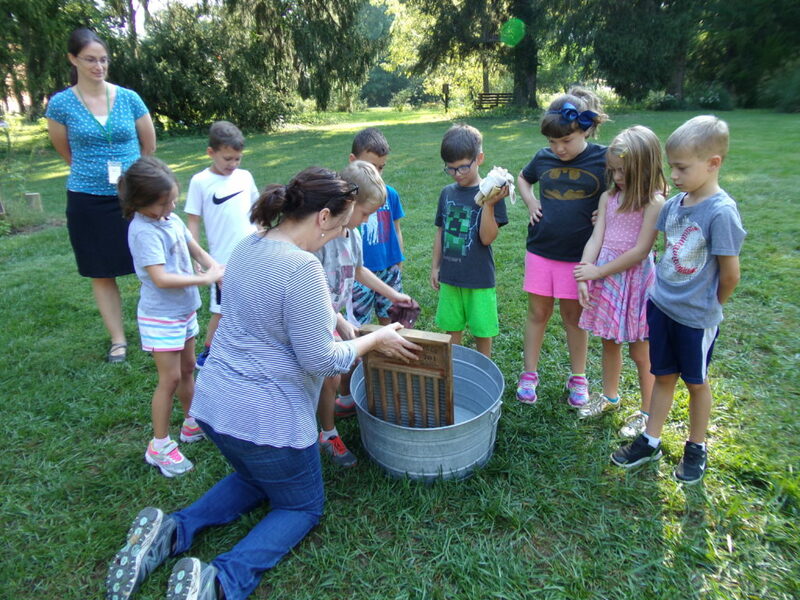 Recent visit to the Miller House Museum by the Madeira Elementary School’s first grade class. 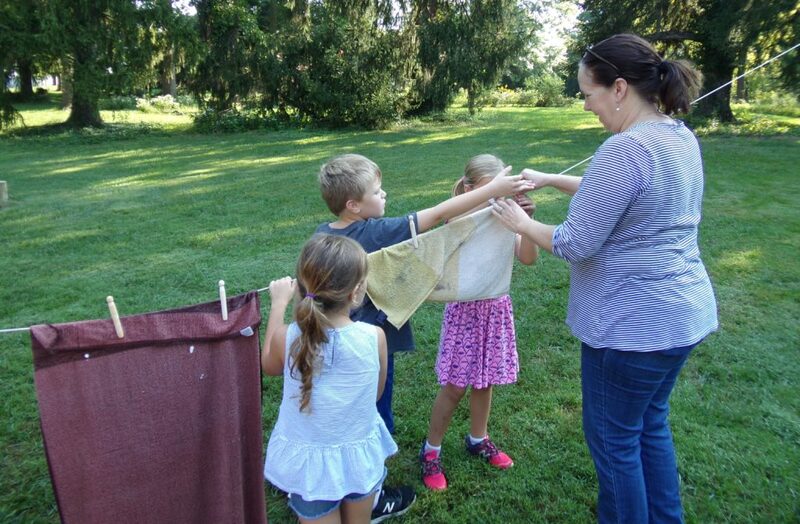 Learning how laundry was washed and dried before the use of modern washers and dryers. 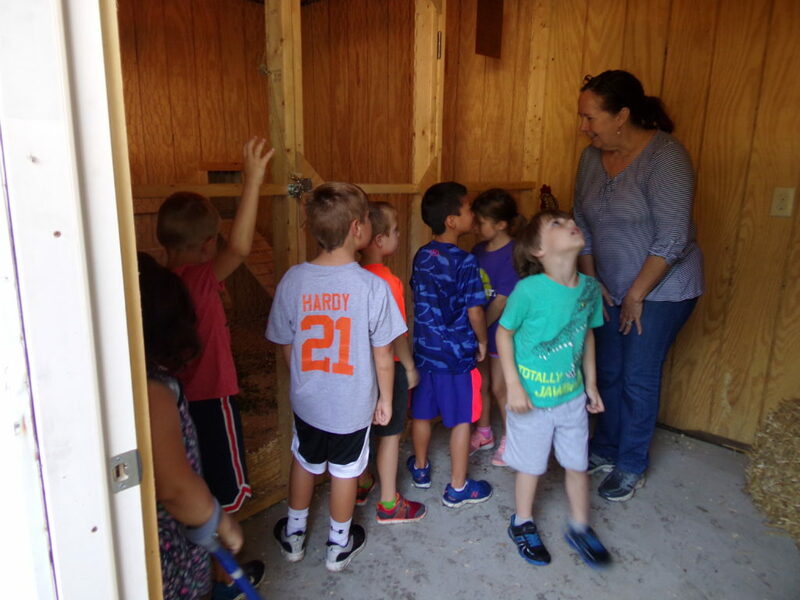 Liz Fredrick showing the 1st grade class the newly restored chicken coop. 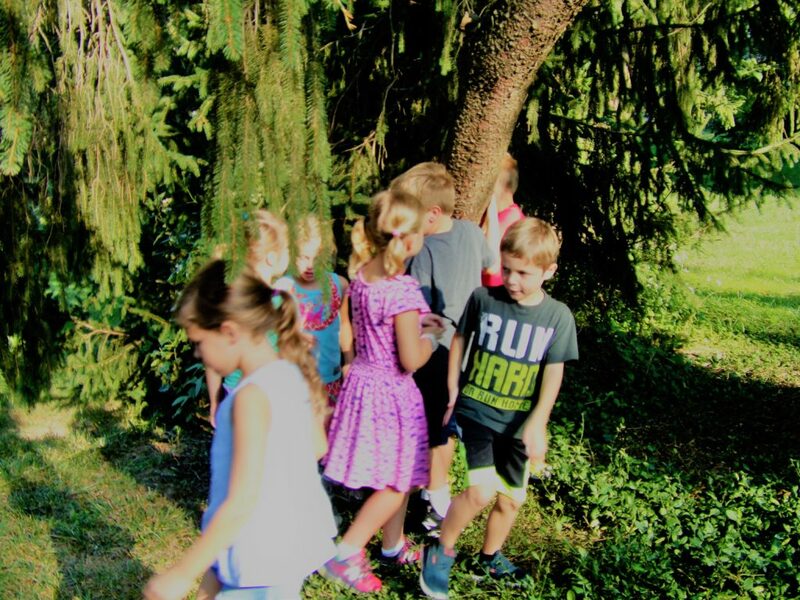 1st graders enjoying the Miller House grounds. 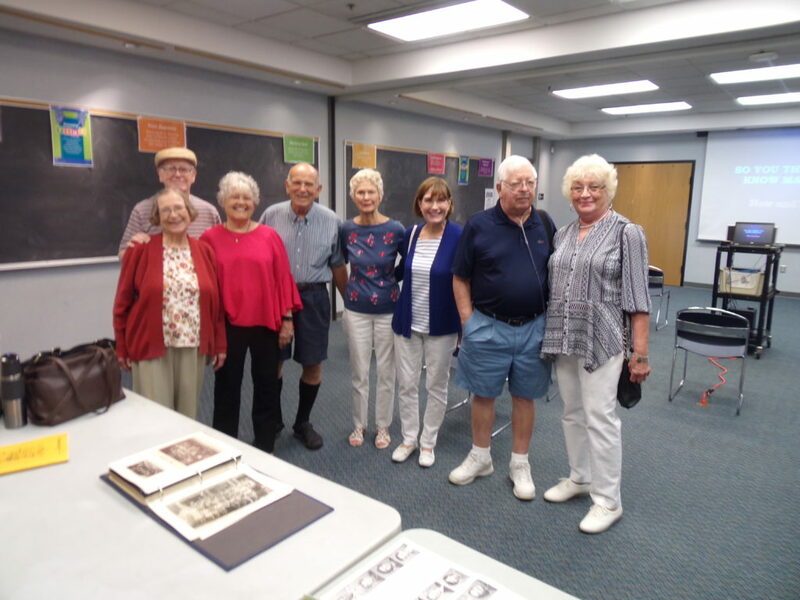 Attendees of the 1951 Madeira Class reunion included; Dan Henke, Carol Robinson Cobb, Harlan Adrick, Pat Keyes Clark, Janet Luckey Cordish, Ray Jacobsen, and Anne Shirk Nobis. 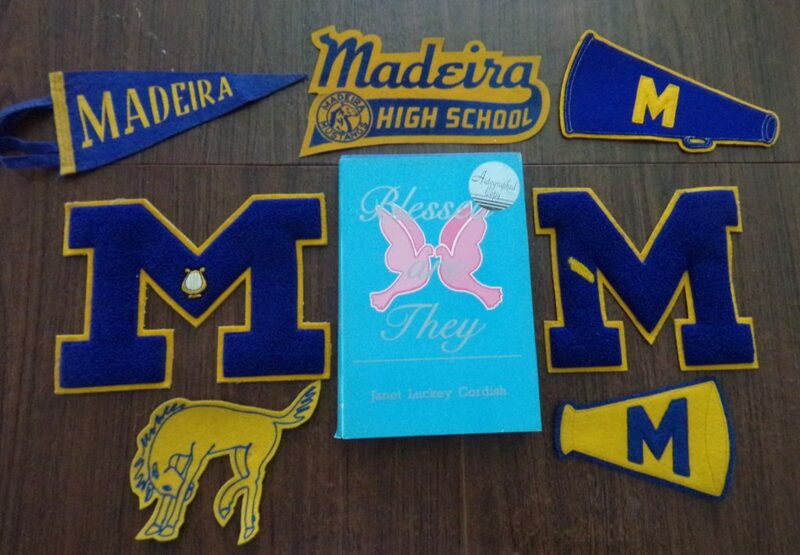 The Class of 1951 donated various memorabilia to the Madeira Historical Society, including a book titled “Blessed are They” authored by Janet Luckey Cordish. 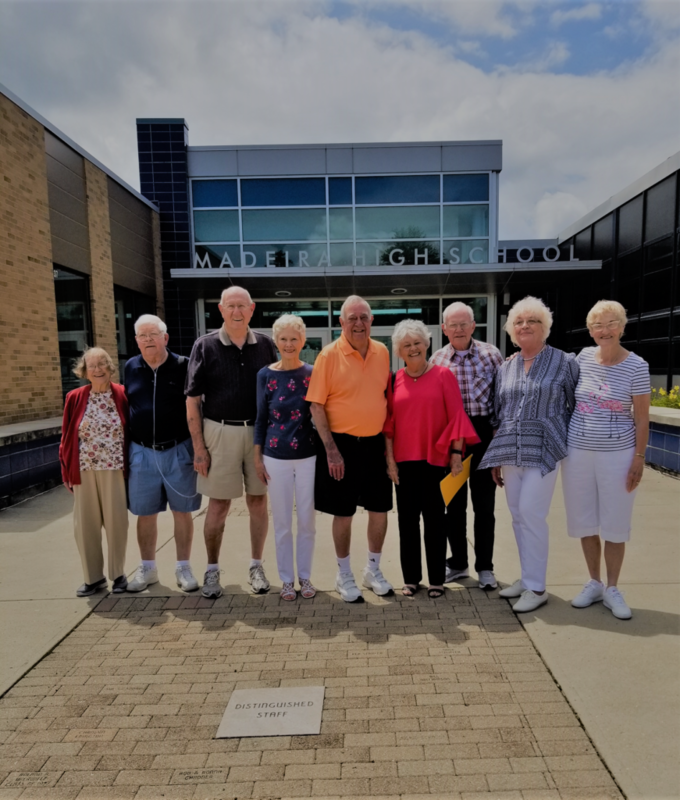 Madeira High School Class of 1951 reunion attendees. Memorabilia donated by the Class of 1951. 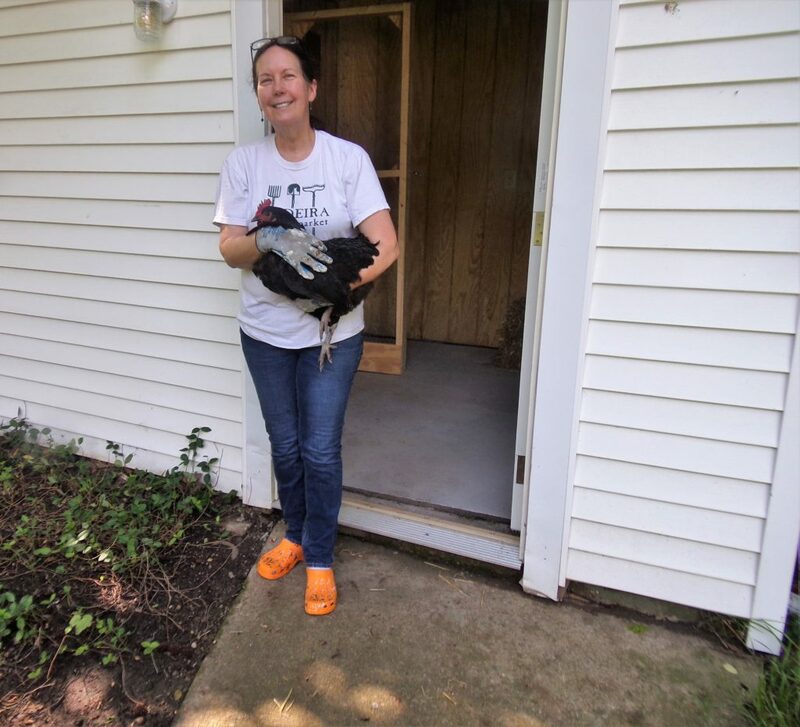 Liz Fredrick had the dream of restoring the Miller House Museum Chicken Coop where both young and old can learn about raising chickens. 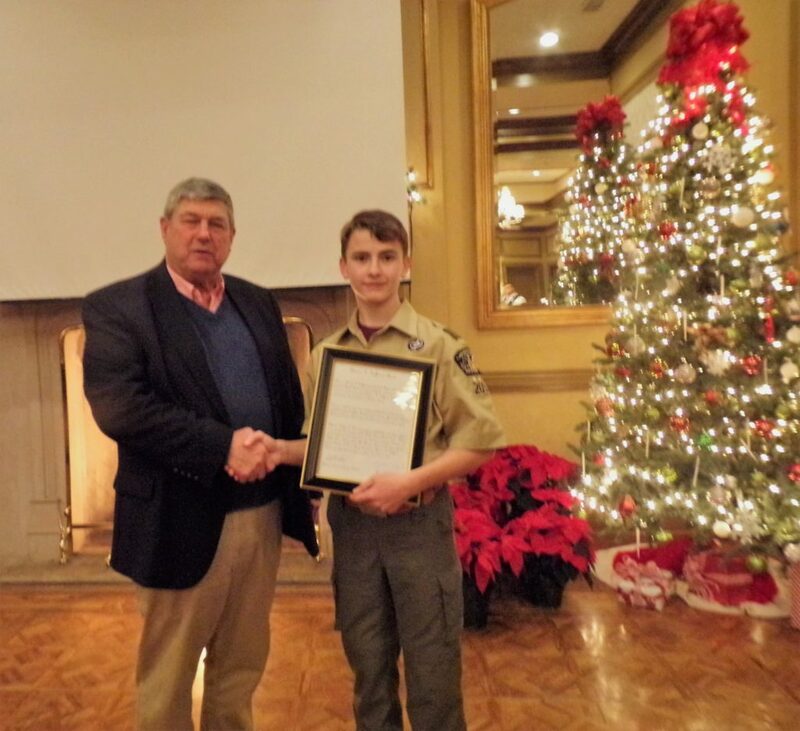 Nathan Born a 15 year old Boy Scout from troop 209 had a dream to become an Eagle Scout. Both Liz and Nathan’s dreams have been fulfilled! 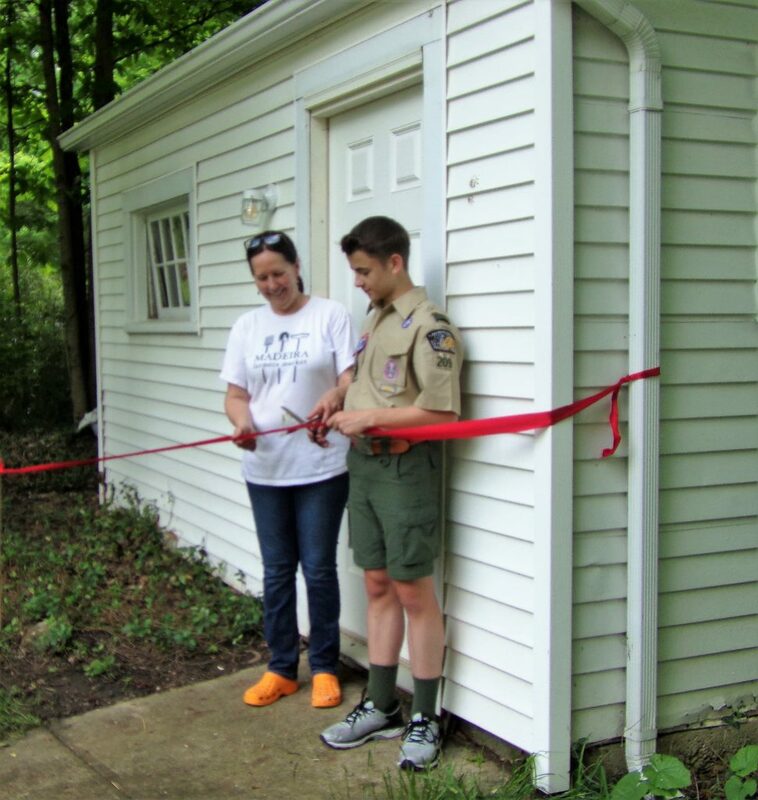 Here you see Liz and Nathan at the ribbon cutting of the restored chicken coop. 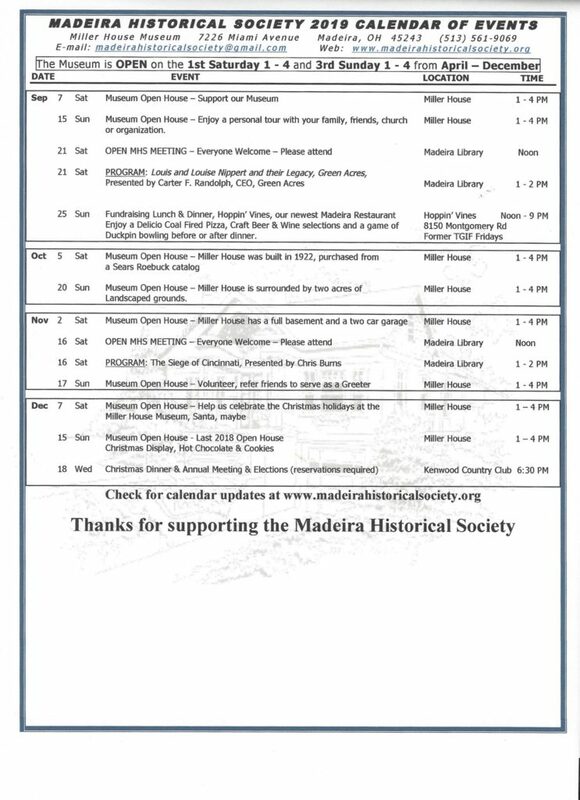 Thank you for your support of the Madeira Historical Society! 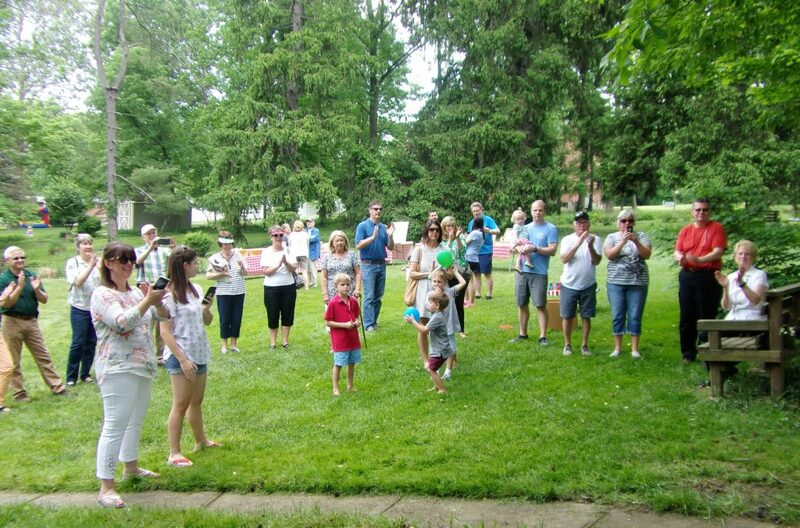 A crowd of onlookers are watching the dedication of the restored Chicken Coop. They are all supporters of the Madeira Historical Society. 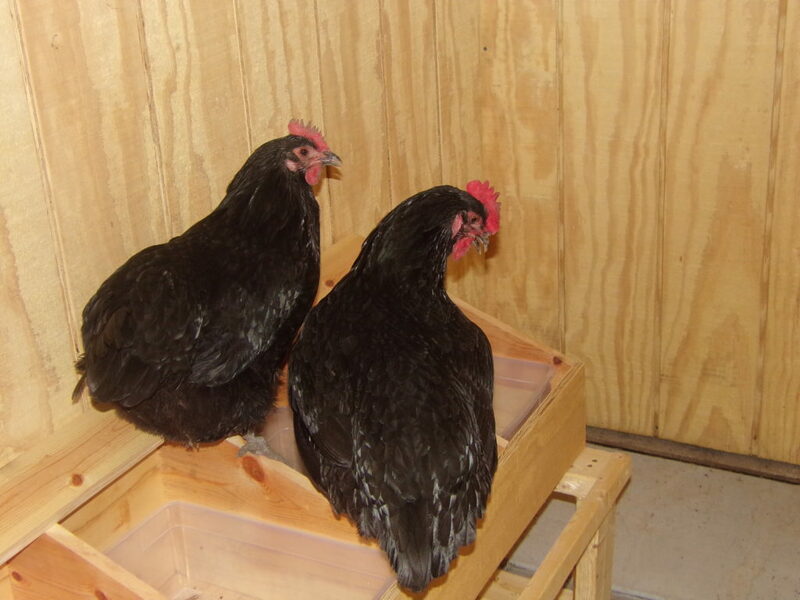 Liz Fredericks provided Black Australian Hens for the celebration. 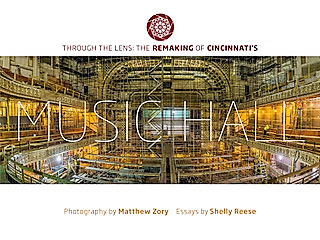 Matt Zory, Assistant Principle Bass Player for the Cincinnati Symphony Orchestra has a new book “Through the lens: The Remaking of Cincinnati’s Music Hall” Matt includes more than 275 photographs in his book. 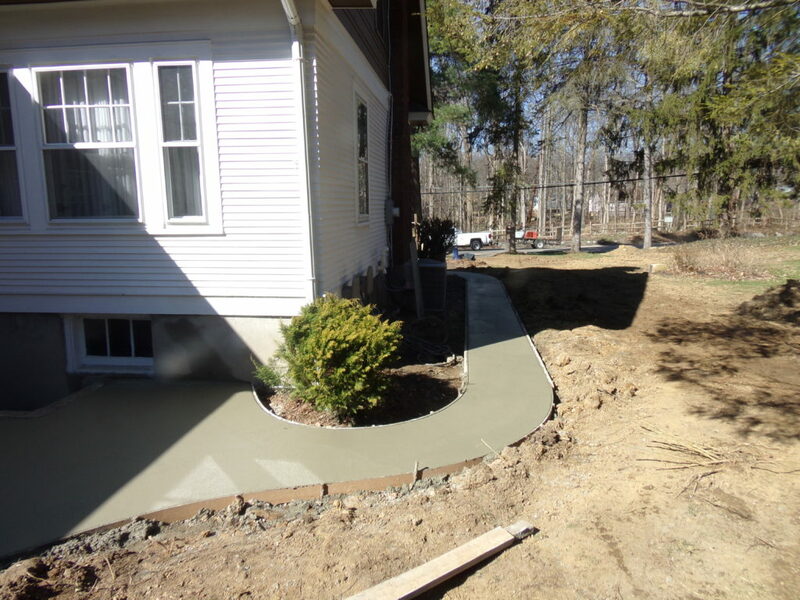 Beautiful new sidewalks have been installed at the Miller House Museum. Nancy King our librarian, is seated in the Hoffman Library. 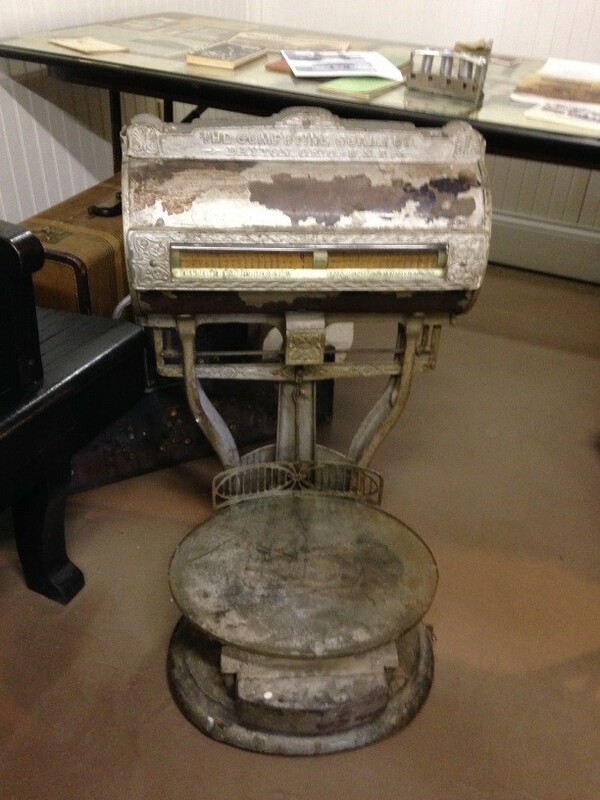 The scale used at the Madeira Railroad Depot for nearly a century is now displayed in the Hoffmann Library in the Miller House Museum. 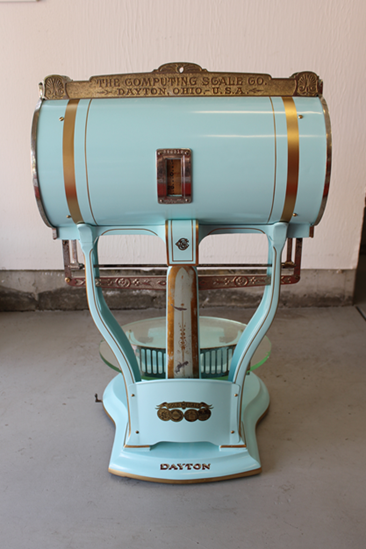 The scale after being refurbished by Dave Bulman, a Madeira Historical Society member and resident. 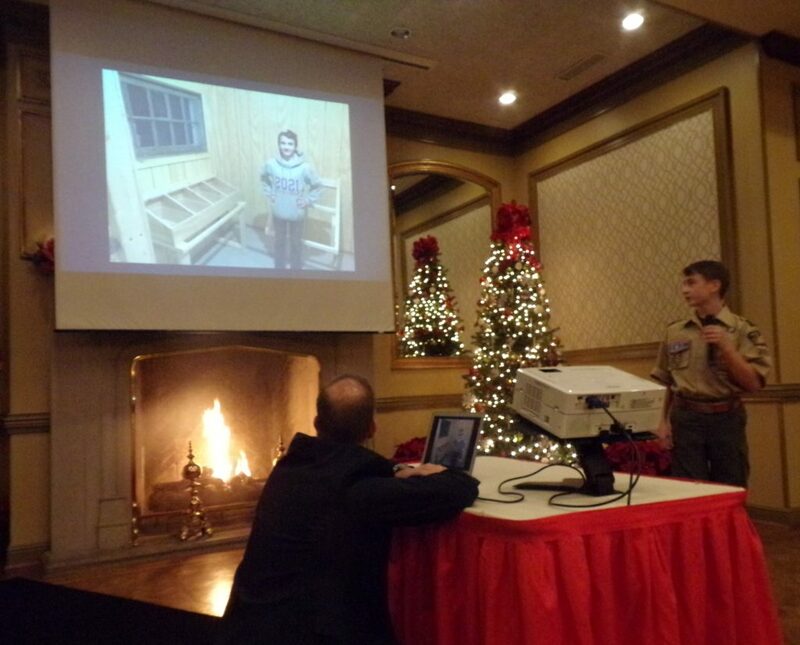 Nathan Born sharing his Eagle Scout Project with the attendees of Madeira Historical Society Christmas dinner. Nathan Born from Boy Scout Troop 1903, receiving the Florence V. Hoffmann Award from Doug Oppenheimer and Liz Fredricks. Click to download a PDF of the membership application form. Membership is open to any person interested in the history of Madeira and the surrounding area. 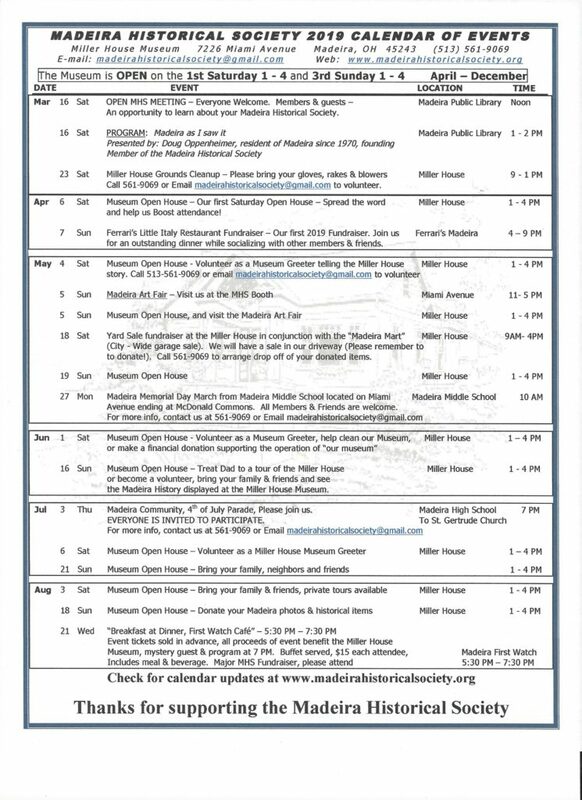 Historical Society Meetings – General membership meetings are held at the Madeira Public Library, please contact us for upcoming meeting details. Please support the Madeira Historical Society through Kroger Community Rewards and don’t forget to ‘Like’ us on Facebook!